This new site brings you the latest news, announcements, responses and programme information from the BBC’s Press Office and publicity teams, the BBC said.. Designed for journalists, bloggers and online commentators, the BBC Media Centre is the first site to launch as part of the BBC’s new series of corporate websites. One of Canada’s largest non-fiction literary awards, the Charles Taylor Prize, has a new presenting partner, RBC Wealth Management, and a new promotion/media deal with CBC Radio and cbc.ca/books. The media partnership with CBC will see prize-nominated authors providing on-line content for CBC Books, including activity on Canada Writes, the writing arm of the public broadcaster’s online book portal. CBC Books will feature the Charles Taylor Prize’s 2012 shortlisted authors assist in the promotion of the award’s presentation on March 5. The winning author receives $25,000 and remaining finalists each receive $2,000. The prize is named in honour of essayist, journalist and author, the late Charles Taylor. The Toronto Star today launched a Saturday supplement which it says will be available only to home subscribers. It's called World Weekly and contains the work of various Star writers, including the recently hired Tony Burman, late of al Jazeera. The section is largely promoted on the front page this day, encouraging anyone who, for example, picked up the Star for free in a coffee shop, to subscribe. And for those who are looking for a serving of the Star's world view, it may be just the thing. Considering the direction of reading habits however, World Weekly seems like a long shot as a subscription builder. Postmedia Network Canada Corp, publisher of the National Post and other daily and community papers across the country, will soon be asking more of its readers to pay for online articles, The Globe and Mail reports. Chief executive officer Paul Godfrey confirmed on Friday that in the coming months, Postmedia will begin expanding its “metered model” – which gives online readers a limited number of free articles before prompting them to pay for access – to the websites of its newspapers across the country. The announcement is not a surprise: Postmedia began testing this model in May on the websites of the Montreal Gazette and the Victoria Times-Colonist. (Postmedia sold the Victoria paper last week.) But this is the most definitive statement yet of how that experiment has gone. Charging for digital access is fast becoming a priority for newspaper publishers struggling to make up for declines in their print business. Hoping to build on its success drawing the young-adult crowd, the ABC Television Group said Wednesday it was planning to launch a new network next spring in Canada called ABC Spark. The Walt Disney Co. unit is partnering on the channel with Corus Entertainment, a publicly traded Toronto-based company, which owns radio stations and TV programming services. Disney will license its content to the service, and Corus will line up distribution. Financial details were not disclosed. The venture aims to create a 24-hour network modeled after Disney's hugely successful ABC Family cable channel in the United States. Newspaper and multimedia company Postmedia Network has sharply reduced its fourth-quarter losses despite a decline in revenue blamed on lower advertising and print circulation income. The publisher of the National Post, formerly part of Canwest, reported a loss of $2.3-million in the three months ended Aug. 31. That compared with a net loss of $44.6-million between July 13 and Aug. 31, 2010, the most closely comparable period. Rogers Communications Inc. reported better-than-expected earnings Wednesday. The communications-services provider said its net profit for the third quarter ended Sept. 30 was $491 million, or 87 cents per diluted share, up from $380 million, or 66 cents a share, a year earlier. Columbia Journalism Review is particularly stern when it comes to the lush payoffs to executives of the gasping for cash Gannet Corporation. A taste: The nation’s biggest newspaper chain has run its papers with threadbare newsrooms to keep profit margins extra-high for shareholders. When the newspaper industry hit the wall a few years ago, Gannett “strip-mined its newspapers in search of earnings, leaving many communities with far less original, serious reporting,” as David Carr writes today in a terrific New York Times column, one of his best. "Newspapers Aren’t Dead, They’re Alluring"
Take it for what it's worth. New York Times. News Corp's third-largest investor has urged Rupert Murdoch to sell all his newspapers and double the size of a share buy-back plan, the Sunday Telegraph reported. "I'd like for them to sell all the newspaper businesses," Kevin Holt, a senior fund manager at Invesco, told the newspaper. "It's a digital world now and the competitive advantage that newspapers had has been competed away." Reuters. As reported by Canadian Press. The New York Times reported a profit for the third quarter and beat analysts’ earnings estimates, but continued to lose advertisers for both its print and digital products, FT.com reports. Paying digital subscribers to the New York Times reached 324,000 in the quarter, compared with 281,000 at the end of the second quarter. Its website paywall, introduced in March, is seen as an important new revenue stream for the publisher, which is facing steadily diminishing print circulation. The Canada Pension Plan Investment Board is partnering with Microsoft Corp.and a private equity firm in a possible bid for Yahoo Inc., the Wall Street Journal reports. The Journal is reporting that the offer would involve billions of dollars, with the largest single contribution coming from Microsoft. CPP Investment Board and Silver Lake Partners would also put up money, as would banks. However, the proposal has not been finalized and could still fall through if the parties can’t get all the money together, the Journal said. CPP Investment Board already has a history with Silver Lake and Microsoft, having once invested in Skype, which was purchased this year by Microsoft.The Investment Board is a federal crown corporation tasked with investing Canada Pension Plan’s funds. For Vancouver Island’s Jon Newton, the court decision Wednesday that ruled he couldn’t be sued for hyperlinks on his website — said to be linked to defamatory material — marked the end of a legal battle that began with a 2006 post on Newton’s site entitled Free Speech in Canada. The decision was welcomed as a victory for the Internet, since hyperlinking — the practice of linking to other content — is an integral part of the web and is used in everything from Twitter posts, to Facebook, to blogs and major news sites. The case against Newton was brought by Vancouver businessman Wayne Crookes, owner of West Coast Title Search, who sued over posts on p2pnet Newton’s news website that focuses on Internet and free speech issues. Crookes argued that hyperlinks on Newton's web site connected to allegedly defamatory material and that by publishing them, Newton was publishing defamatory content. British Columbia courts disagreed and ruled in favour of Newton and Crookes took the issue to the Supreme Court of Canada, where a number of intevenors arguing for free speech on the Internet took part, including the Canadian Civil Liberties Association, the Canadian Internet Policy and Public Internet Clinic, the Canadian Newspaper Association and others. In a unanimous decision, the Supreme Court ruled that posting a link to defamatory material doesn’t leave the person posting it open to lawsuits. The court likened hyperlinks to footnotes and said they should not be seen as publication of the content they are linking to. The public subsidies have allowed Quebecor to make profits, yet it “complains that its TVA television network ‘competes’ against Radio-Canada,” CBC claims. The CBC also alleges that Quebecor president Pierre Karl Peladeau has written more than a dozen letters to Prime Minister Stephen Harper to ask that his government advertise more in the company’s newspapers. Shaw Communications Ine.announced on Wednesday that it had reached a long-term deal to carry 30 channels owned by Bell Media, declaring that the deal is proof that companies can reach fair deals for content without the intervention of the federal broadcast regulator. 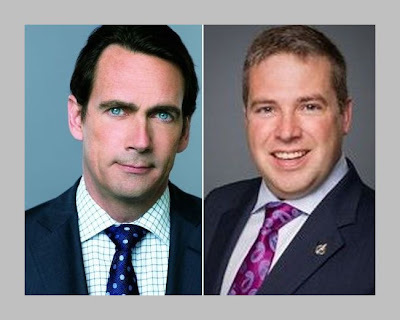 The announcement comes as Bell faces numerous complaints to the Canadian Radio-television and Telecommunications Commission from other cable, satellite and IPTV distributors about negotiations for the channels that it owns. Glacier Media Inc.says it will buy the Victoria Times-Colonist and other daily and community papers in British Columbia, continuing a recent wave of deals in the Canadian newspaper industry. The $86.5 million acquisition from Postmedia Network Inc. also includes two other dailies and 20 weekly and bi-weekly community papers and related digital media and real estate assets. The community newspapers Glacier is buying are on the B.C. Lower Mainland and Vancouver Island. Glacier president and CEO John Kennedy said the deal significantly increases Glacier's presence in B.C. and gives the Vancouver-area based publisher the broadest local newspaper coverage in Western Canada. Legendary broadcaster Joel Aldred, who has died at age 91, leaves behind a giant footprint as a radio and television personality and businessman who helped shape the face of communications in Canada and the United States. Aldred was also a decorated bomber pilot in the Second World War, serving as squadron leader and acting wing commander. He won a Distinguished Flying Cross. Famous for his voice, Aldred had an international broadcasting career that lasted for over 50 years. He started as a radio announcer with the CBC in 1945. He claimed to be the first person ever fired from the CBC when, in 1949, he referred to the network as a ''socialistic monopoly'', creating a political stir at the time. Undeterred, he went on to build a successful broadcasting career and in the 1950's, became one of the highest paid and most in-demand advertising Broadcasters in Hollywood. In 1960, Aldred formed a business corporation, Aldred-Rogers Broadcasting, with the late Ted Rogers, and they, with other investors (Telegram Corporation and Foster Hewitt Broadcasting), launched CFTO Television, which eventually became the CTV Television Network. As the first President at CFTO, Aldred was instrumental in modernizing television in Canada, bringing in the first colour TV broadcasting equipment. Kevin O'Leary, the business guru who appears on CBC, is facing a new complaint launched by two of Canada's big public-sector unions who say some of his anti-labour comments may have lead to violence. The 340,000-member National Union of Public and General Employees and the Ontario Public Service Employees Union have filed a complaint with CBC Ombudsman Kirk LaPointe over recent anti-union comments it says were offensive. "During the September 19, 2011 episode, Mr. O'Leary stated that if he were elected prime minister, he would 'make unions illegal' and union members should be "thrown in jail," NUPGE/OPSEU said in a joint news release. "Later, he evokes religious imagery to promote the destruction of unions, stating that 'Unions are sheer evil' … 'Unions themselves are born out of evil. They must be destroyed with evil,' and … 'Look, no one could contain unions in hell. They were so evil they came out of hell and they came upon earth.' "
NUPGE president James Clancy said O'Leary's comments "are not only highly offensive, they are very disturbing, irresponsible and potentially illegal. "Mr. O'Leary's willful promotion of contempt and hatred towards unions reflects a viewpoint that has often ended in violence perpetrated against union members and leaders around the world," he said. The complaint refers to instances of violence against the unions' members involved in a legal strike against the Colleges of Applied Arts and Technology around the time O'Leary made his comments. O'Leary was already in hot water for his nasty interview of an Occupy Wall St. supporter. Click on the title to read the rest of the New York Times story. This is a Toronto Star video of some of Monday's Occupy Toronto activity. As news however, the content of the video seems less dramatic than the decision by the Star to permit the general embedding of its video in other Internet locations. So far as is known, the Star is the first of the traditional media companies to permit this use. Other newspapers and both CTV and CBC, do not make their news video available for embedding. In the U.S.and elsewhere however, the practice is becoming quite common. It started a few years ago when CBS News decided to put its entire output on the Internet with universal embedding. How to pronounce Justice Andromache Karakatsanis's name. Craig Oliver's memoir, Oliver's Twist, is to be published on October 25 by Penguin. The blurb says "this many-layered memoir of an extraordinary professional and personal life. The only child of two alcoholics, he spent his childhood and adolescence in the homes of strangers. A chance summer job with the local CBC station launched his broadcasting career, taking Oliver from Prince Rupert, B.C. to Ottawa, Washington, and Central America. He witnessed up close the follies, foibles and occasional brilliance of the men and women who shaped our history over four decades." Those who know Craig are aware that he has been legally blind for more than a decade. A great raconteur, the book is sure to be entertaining. The title links to Amazon for a pre-order. Long time Ottawa Sun writer and Sun columnist Earl McRae died of a heart attack on Saturday. He was 68. McRae also worked for the CBC, and the Toronto Star. McRae won three National Magazine gold awards for sports journalism and two silvers. He also won three Ontario Newspaper Awards for column writing. He had his own radio and television shows in Toronto and Ottawa. Torstar Corp. will pay Swedish firm Metro International $51.5 million to take nearly full control of the Canadian chain of Metro free daily newspapers, which are read by more than one million commuters each day. CBC’s ombudsman says Kevin O’Leary’s heated remarks during an interview with author Chris Hedges violated the public broadcaster’s journalistic standards. The watchdog says hundreds of complaints were filed after Mr. O’Leary called the Pulitzer Prize-winning journalist “a nutbar” during CBC News Network’s The Lang & O’Leary Exchange on Oct. 6. The remark came during a seven-minute segment about the Occupy Wall Street protests unfolding in the United States. “There is room at the inn for a range of views, but there is no room for name-calling a guest,” CBC ombudsman Kirk LaPointe writes in a decision dated Oct. 13. LaPointe says CBC News correctly issued a private apology to Mr. Hedges after the interview but should also have apologized on air. A CBC spokesman was not immediately available Friday to say whether that recommendation would be implemented. Revenues at the web search giant soared by a third to $9.7 billion in the three months to 30 September, as net profits grew more than a quarter to $2.7billion. The figures beat analyst expectations and allayed fears that Google's recent hiring spree would take its toll on profits. The company, which recently announced plans for a new office in London, took on 2,585 new staff in the three-month period, taking its total headcount to 31,353. Its results, released on Thursday night, offered a reminder of how Google is using its position as the internet's dominant gateway to build a business that weathers economic turbulence better than most companies. They also highlighted Google's rapid expansion into new areas outside web search, and the seriousness of its challenge to Facebook as a social networking platform. Wall Street Journals: In a Thursday memo to staff, the executive editor of The New York Times, Jill Abramson, and others said that "no matter how many people do or do not raise their hands," no one in the newsroom would be laid off as a result of the buyout program. The memo also said the Times reserves "the right to turn down some volunteers who are in those areas of the newsroom where we feel we cannot reduce our numbers." Should stuff that's public on the web be private? BC's privacy commissioner is taking a run at that contradiction, saying no one should make background checks off social media. The question has to be "Why not?" No friend to Rupert Murdoch, the Guardian has run a story saying that the Wall Street Journal European edition had inflated its circulation numbers. News Corp has fired back that the Guardian story is replete with errors. BlackBerry users in Europe, the Middle East, Africa and India suffered email outages for several hours on Monday. By this afternoon, the problem had been isolated to a server in Slough in Berkshire the BBC said. Twitter users and Reuters correspondents from Britain to Dubai to New Delhi reported disruptions or complete outages of their email and BlackBerry Messenger services. Bertelsmann, the owner of such media powerhouses as Random House, broadcaster RTL and many others, has brought in "energetic" CFO Thomas Rabe (left) to be the new CEO. 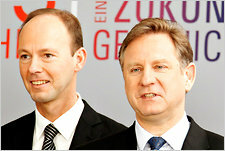 This after chief executive Hartmut Ostrowski (right) unexpectedly resigned "by mutual consent". The German media conglomerate said the 46-year-old Mr. Rabe, a rising star on the corporate German landscape, would take over Mr. Ostrowski's post on Jan. 1, one year before the CEO's contract was due to expire. Wall Street Journal. The question weighing on the minds of Canada's airline travellers this morning is: "What on earth is going on with the Air Canada flight attendants? Does Air Canada need to deploy the oxygen masks to help them see things clearly? The flight attendants have rejected two tentative contracts now, both negotiated and approved by their representatives. The union, CUPE, has won them pay raises in keeping with the economy. Sadly, the media has done a poor job of getting inside the Air Canada local so we have to surmise a bit. But it seems clear that there is militant resentment for past sacrifices made when Air Canada was bankrupt. But we have news. The airline industry is a notoriously marginal business. Further, Air Canada is under assault at home and aboard by foreign luxury airlines like Emirates, Singapore and South Korea where the flight attendants do pretty much as they are told. Call it wrong but there is nothing CUPE or the Government of Canada can do about it. Flight attendants should understand that the reward for digging in against an struggling employer is usually unemployment. RELEASE -- (Edited) -- Torstar Corporation release its third quarter results at 6:30 a.m. on November 2, 2011 and has scheduled a conference call for November 2, 2011 at 8:15 a.m. The dial-in number is (416)-340-2216 or 1-866-226-1792. We invite you to join David Holland, President and Chief Executive Officer and Lorenzo DeMarchi, Executive Vice-President and Chief Financial Officer for this call. A live broadcast of the conference call will also be available over the Internet on the Investor Relations (Conference Calls) page at www.torstar.com .For anyone unable to participate, a recording of the conference call will be available for 9 days at (905) 694-9451 or 1-800-408-3053 reservation number 3672277. An online archive of the broadcast will be available shortly after the completion of the call and will be accessible by visiting the Investor Relations (Conference Calls) page on the www.torstar.com website. Well written editorial by Russell Frank at StateCollege.com, which appears to be an adjunct of Pennsylvania State College. The headline sets the tone of Mr. Franks remarks. He ticks off the New York times, among others. He says "the dominant tone of the Times's coverage of the Occupy Wall Street protest has been dismissive, as if political protest were some tired and ineffectual tactic from the '60s and participants are latter-day hippies who needn't be taken seriously." Well said sir, keeping in mind that many people think that this type of political protest is not only "tired" but also incoherent. Welcome to the wonderful world of free speech. Netflix Inc.will remain out of the reach of Canada's broadcast regulator - for now. The CRTC said on Wednesday that there is still no conclusive evidence that Internet-delivered television services such as Netflix are disrupting the traditional broadcast business in Canada. The report was the result of a fact-finding mission the CRTC launched in May to look into such "over-the-top" TV services. Because of "inconclusive results," the CRTC will not begin regulating broadcasting on new platforms. "The traditional broadcasting system continues to support Canadian programming even as services emerge to deliver content to Canadians in new ways," the CRTC said in a release. Premier Christy Clark's proposed Riot TV plan is unlikely to take off because judges are only expected to allow cameras in courtrooms with the consent of defendants, says the president of the B.C. Crown Counsel Association. A provincial court directive sets out the conditions for media to apply to broadcast courtroom proceedings, and one rule stipulates that the application must be signed by all parties in the trial, including the accused. "It doesn't seem very likely at all," said Samiran Lakshman, the Crown counsel association president. Defence lawyer Ravi Hira of Vancouver said it would be a very "rare circumstance" for any defence lawyer to agree to this kind of publicity. Apple Inc co-founder and former CEO Steve Jobs, counted among the greatest American CEOs of his generation, died on Wednesday at the age of 56, after a years-long and highly public battle with cancer and other health issues.Jobs' death was announced by Apple in a statement late on Wednesday.The Silicon Valley icon who gave the world the iPod and the iPhone resigned as CEO of the world's largest technology corporation in August, handing the reins to current chief executive Tim Cook. The Daily Mail fabricated a news report on the end of the Amanda Knox trial. Within seconds of the judge starting to announce the verdict, broadcast live on satellite television, the newspaper’s website, dailymail.co.uk, published a report headlined “Guilty: Amanda Knox looks stunned as appeal against murder conviction is rejected”. But the newspaper went further than just having two reports ready to hand, each based on one of two possible outcomes – Knox’s appeal being rejected or upheld – and publishing the wrong one in error. By opting for the appeal being rejected, the paper published a wholly invented account of what happened next. “As Knox realised the enormity of what Judge Hellman was saying, she sank into her chair sobbing uncontrollably while her family and friends hugged each other in tears,” the website reported. “A few feet away, Meredith [Kercher]’s mother, Arline, her sister Stephanie and brother Lyle, who had flown in especially for the verdict, remained expressionless, staring straight ahead, glancing over just once at the distraught Knox family. The fabricated report continued: “Following the verdict, Knox and [Raphael] Sollecito were taken out of court escorted by prison guards and into a waiting van which took her back to her cell at Capanne jail near Perugia and him to Terni jail, 60 miles away. The report and invented quotes were removed once it became clear that Knox and Sollecito had in fact won their appeal. B.C.s Attorney-General Shirley Bond signed an order Tuesday compelling Crown prosecutors to request television cameras and radio microphones during trial of all criminal cases involving the Stanley Cup riots. The move follows a call in the government’s throne speech Monday for the trials to all be broadcast on radio and television. Crown prosecutors had at first resisted the idea, though on Tuesday a spokesman said they will respect the minister’s direction. “The branch respects the decision of the attorney-general to issue that direction,” said Neil MacKenzie. “We’re not suggesting that we want to put any prosecution at risk; we’re simply saying this needs to be considered in the public interest and remember the ultimate decision will be made by the judge that presides over that trial,” she said. The head of investigative journalism at Radio-Canada, the French-language network of the CBC, has been suspended after he posted false statements on Facebook implicating another broadcaster in an investigation into organized crime. Pierre Sormany (pictured) alleged that political columnist Jean Lapierre -- a popular host on the privately owned French-language TVA and LCN networks, and a former federal Liberal cabinet minister -- was linked to businessman Tony Accurso, whose name has been associated with investigations into organized crime. In a public Facebook posting, Sormany stated that Lapierre had served as a go-between to intimidate Jacques Duchesneau, the head of the anti-collusion unit that was investigating operations linked to Accurso. Accurso is the owner of two businesses that pleaded guilty to charges of fraud totalling $4.1 million. Lapierre is suing Sormany for $250,000 for tarnishing his reputation with “false and defamatory” statements. BBC reviews reaction from Italian, British and American media to the acquittal on appeal of US citizen Amanda Knox and Italian Raffaele Sollecito of the murder of UK student Meredith Kercher in 2007. "U.S. newspapers gone by 2017"
It may not be wise to take Francis Gury too seriously but when it comes to predicting the end of newspapers. This Euro guru is quoted on AFP as saying they're gone by 2017 in the states. Europe (and the French of course) will hang on until 204. Gury is the head of the UN intellectual property agency. "It's an evolution. There's no good or bad about it. There are studies showing that they will disappear by 2040. In the United States, it will end in 2017," he said. The Star's public editor, Kathy English, has a thoughtful column about media's policy on reporting suicides. "Star editor Michael Cooke also thinks we need to report the truth when someone takes their own life. He likens the silence around reporting suicide to a time when people felt shame in talking about death from cancer. "In reporting stories about suicide, the media can spark important public discussion about depression and the serious mental health issues that affect one in five Canadians. Certainly we’ve seen that occur in recent weeks in the aftermath of the deaths of the two hockey players. "The conventional media silence around suicide does seem to be shifting and a view emerging that journalists have a responsibility to report the facts about suicide — which claims many more lives in Canada than homicide or car crashes. . ."
The federal government is stuck in the last century when it comes to making electronic data available to the public, says a new study. A national freedom-of-information audit by a newspaper industry association found federal agencies refused to release statistical tables in electronic format. Instead, the departments disclosed paper copies or pictures of the figures that can't be opened for analysis in a computer program — even though the Access to Information Act says records should be provided to the public "in the format requested." "I think it's absurd," said Fred Vallance-Jones, a University of King's College journalism professor who led the project for Newspapers Canada. "We're in the second decade of the 21st century, when everybody from three years old up uses data routinely. And governments still seem to want to enforce the 1980s on us. It really is absolutely baffling." Overall, the audit found that using the web of information laws across the country to dislodge information from government files means being hindered by excessive delays and unnecessary fees.